This class implements an abstract interface to all emitters in Mitsuba. The term emitter is interpreted in a loose bidirectional sense here, where luminaires and sensors are both considered to be emitters of radiance and importance, respectively. Subclasses must implement functions for evaluating and sampling the emission profile and furthermore support querying the probability density of the provided sampling technique. Subclasses must also provide a specialized direct sampling method (a generalization of direct illumination sampling to both emitters and sensors). A direct sampling is given an arbitrary input position in the scene and in turn returns a sampled emitter position and direction, which has a nonzero contribution towards the provided position. The main idea is that direct sampling reduces the underlying space from 4D to 2D, hence it is often possible to use smarter sampling techniques than in the fully general case. Since the emission profile is defined as function over both positions and directions, there are functions to sample and query each of the two components separately. Furthermore, there is a convenience function to sample both at the same time, which is mainly used by unidirectional rendering algorithms that do not need this level of flexibility. One underlying assumption of this interface is that position and direction sampling will happen in sequence. This means that the direction sampling step is allowed to statistically condition on properties of the preceding position sampling step. When rendering scenes involving participating media, it is important to know what medium surrounds the sensors and light sources. For this reason, every emitter instance keeps a reference to a medium (or NULL when it is surrounded by vacuum). Flags used to classify the emission profile of different types of emitters. Emission profile contains a Dirac delta term with respect to direction. Emission profile contains a Dirac delta term with respect to position. Is the emitter associated with a surface in the scene? Create a special shape that represents the emitter. Some types of emitters are inherently associated with a surface, yet this surface is not explicitly needed for many kinds of rendering algorithms. An example would be an environment map, where the associated shape is a sphere surrounding the scene. Another example would be a perspective camera with depth of field, where the associated shape is a disk representing the aperture (remember that this class represents emitters in a generalized bidirectional sense, which includes sensors). When this shape is in fact needed by the underlying rendering algorithm, this function can be called to create it. The default implementation simply returns NULL. Evaluate the directional component of the emission profile. When querying a smooth (i.e. non-degenerate) component, it already multiplies the result by the cosine foreshortening factor with respect to the outgoing direction. Evaluate the spatial component of the emission profile. Return an axis-aligned box bounding the spatial extents of the emitter. 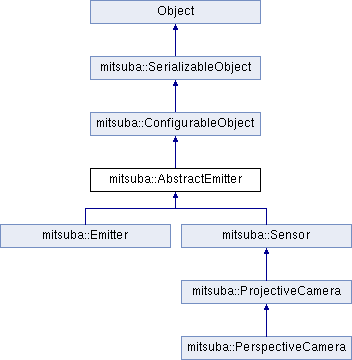 Reimplemented in mitsuba::Emitter, mitsuba::PerspectiveCamera, mitsuba::ProjectiveCamera, and mitsuba::Sensor. Return the measure associated with the sampleDirect() operation. Return a pointer to the medium that surrounds the emitter. Return the shape, to which the emitter is currently attached. Return a listing of classification flags combined using binary OR. Return the local space to world space transformation. Does the sensor have a degenerate directional or spatial distribution? Does the emitter lie on some kind of surface? Does the method sampleDirection() require a uniformly distributed sample for the direction component? Does the method sampleDirect() require a uniformly distributed sample? Since sampleDirect() essentially causes a 2D reduction of the sampling domain, this is the case exactly when the original domain was four-dimensionsional. Does the method samplePosition() require a uniformly distributed sample for the spatial component? Evaluate the probability density of the direct sampling method implemented by the sampleDirect() method. Evaluate the directional component of the sampling density implemented by the sampleDirection() method. Evaluate the spatial component of the sampling density implemented by the samplePosition() method. Direct sampling: given a reference point in the scene, sample an emitter position that contributes towards it. Given an arbitrary reference point in the scene, this method samples a position on the emitter that has a nonzero contribution towards that point. This can be seen as a generalization of direct illumination sampling so that it works on both luminaires and sensors. An importance weight associated with the sample. Includes any geometric terms between the emitter and the reference point. Conditioned on the spatial component, importance sample the directional part of the emission profile. Some implementations may choose to implement extra functionality based on the value of extra: for instance, Sensors (which are a subclass of AbstractEmitter) perform uniform sampling over the entire image plane if extra == NULL, but other values, they will restrict sampling to a pixel-sized rectangle with that offset. An importance weight associated with the sampled direction. This accounts for the difference between the directional part of the emission profile and the density function. Importance sample the spatial component of the emission profile. This function takes an uniformly distributed 2D vector and maps it to a position on the surface of the emitter. An importance weight associated with the sampled position. This accounts for the difference between the spatial part of the emission profile and the density function. Set the medium that surrounds the emitter. Set the local space to world space transformation.